Many intelligent people still stereotypically consider comics to be for “kids and teenagers”. However today there is no escaping this fact: comics are big business. A slew of Hollywood films based on comics have led to the medium’s repopularisation – while the humble comic has progressed vastly since the early days of characters like Spiderman and Batman. In the late 1970s and 80s there was a revolution as comics like 2000AD, RAW and Warrior introduced intelligent, controversial writers like Alan Moore to the world. The underground became more mainstream, gone were the Boy’s Own style adventuring and all-American heroes, replaced by altogether darker themes and characters. If Moore’s Watchmen (1986-87) and V For Vendetta (1982–89) – both now mediocre films – proved that comics could ‘do’ serious and thoughtful fiction, then the Pulitzer-winning Maus proved that comics could tackle important issues of non-fiction too – in Maus’ case, the darkest episode of 20th Century history, the Holocaust. Below I review some of the best (and unfortunately, in one instance, not-so-best) graphic non-fiction available today. 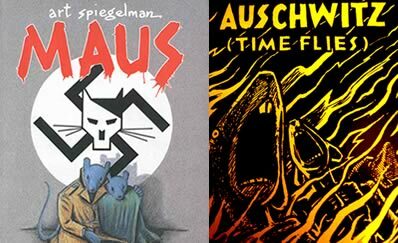 Maus is the story of Spiegelman’s father Vladek’s Holocaust survival, and also of Spiegleman’s strained relationship with his father as he interviews him about his experiences. Vladek was a Polish Jew and Maus follows his story fighting in the Polish army, escaping deportation and living on the run, eventual capture and his survival of the Auschwitz-Birkenau death camp. Interwoven into the Holocaust narrative are snapshots of Vladek’s contemporary life in American suburbia where we see the psychological effects the Holocaust has left on his family; his first wife’s suicide, second loveless marriage and tense relationship with his son. A truly harrowing work, it is also brilliant, standing out among reams of Holocaust literature – original in concept, human and complex in narrative (Vladek is no hero, he just resourcefully does what he must to survive) and steers away from cynical ‘Holocaust exploitation’. The artwork – minimalist, monochrome and bleak – works perfectly, while the portrayal of Jews as mice, Germans as cats etcetera was meant, Spiegelman says, to “self-destruct” the idea of Nazi racial divisions. Of course, graphic non-fiction existed before Maus, but there is little doubt that this work ensured comics were viewed as legitimate a medium for non-fiction as literature and film. Indeed, as one review said, Maus is a work that would be “impossible to achieve in any medium but comics”. 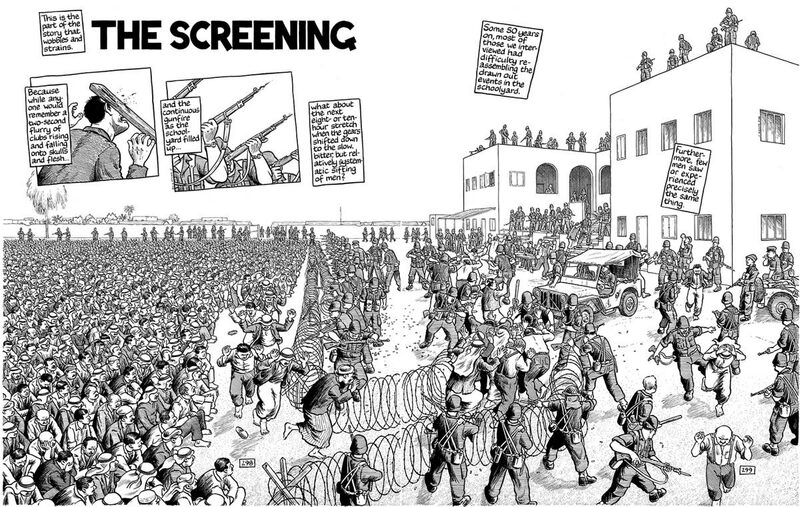 Sacco is a Maltese-American ‘graphic journalist’ – he travels to conflict zones and illustrates (visually and verbally) his experiences, the people he meets and their stories. Sacco first travelled to Palestine in 1991/92 during the dying days of the first intifada, and Palestine is a chronicle of this era. Sacco presents us with ordinary people’s everyday stories and oral histories, giving us entwined narratives that both reflect then-contemporary events and outline the broader historical injustices – 1948: expulsions of 700,000+ Palestinians to facilitate the founding of Israel, 1967: occupation of the West Bank and Gaza, 1987: outbreak of the intifada etc – that have resulted in Palestinians’ woeful situation. Above all, unlike many dry texts I’ve read, Sacco achieves the humanisation of Palestinians – they are not statistics or pawns, they are people and – agree or disagree – have valid things to say. In telling this story, Sacco is knowledgeable, self-depreciating, humourous and critical. Sacco’s artwork is amazing and has an unparalleled ability to convey emotion. That this is an illustrated work gives it added potency as he can draw what would be unavailable to a photographer and descriptively unwieldy for a writer – eg, Israeli torture and sensory deprivation methods. 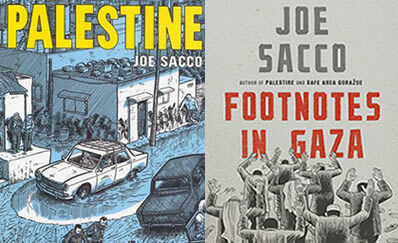 Footnotes in Gaza sees Sacco return to Palestine to investigate the story of two overlooked Israeli massacres in Gaza during the 1956 Suez Crisis. UN reports say Israeli forces killed 275 civilians in Khan Younis and 111 in Rafah in acts Sacco describes as “airbrushed from history”. As with Palestine, there are two narratives – the contemporary set against backdrop of the second intifada in 2003 as he searches for stories, and the historical as he unlocks people’s memories. Both Palestine and Footnotes are fantastic, if ultimately human stories and therefore subject to human error. For me they are better introductions to Palestine than many history books – indeed I would argue that Palestine is one of the greatest works about the region in any medium. Che Guevara’s iconic image is an ever-present feature of life, adorning everything from t-shirts to beermats as capitalism continues to commodify the “revolutionary chic” of this unyielding fighter for socialism. As Lenin said, great revolutionaries are hounded by the ruling classes during their lifetimes, and converted into harmless idealistic icons upon their deaths. Rodriguez’s book is a conscious antidote to this tendency, using the visual medium to recontextualise Che’s image, life and ideas. On a short, exciting journey through Che’s equally brief and eventful life, Rodriguez takes us from his birth and travels in Latin America – which would have a politically formative effect on him as he experienced the 1954 CIA coup in Guatemala – to his first meeting with Fidel Castro. We then explore his leading role in the Cuban Revolution, both as a commander and later as he dealt with post-revolutionary and geopolitical realities, and finally his futile militant activities in Congo and untimely death, aged 39, at the hands of the CIA in Bolivia. Thankfully this is not one man’s wild and romantic adventure story, Rodriguez is careful to place Che in the context of his era; social and political struggles against economic realities are not ignored in pursuit of some ‘great man’ theory of history. This Che will be familiar to those who have read J.L. Anderson’s biography – Che is not presented as an infallible secular saint, he is a man who makes mistakes in pursuit of a better future for humanity. 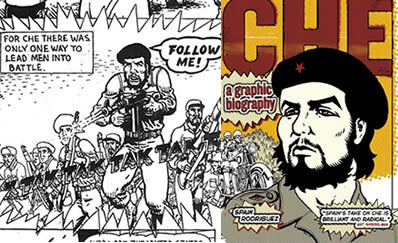 Hopefully those picking up this comic and knowing little beyond the iconography will develop an understanding of this socialist fighter who believed in, fought and died for the unity of all oppressed peoples – something as necessary today as in Che’s lifetime. The best that can be said about this work is that it is unique; it is basically an Irish Boy’s Own comic – which for someone who grew up reading English and US war stories was an interesting experience. Unfortunately, for an adult this is a major failing – Hunt’s version of 1916 is pure militaria, lacking in socio-historical context, interesting characters (and given those involved in 1916 that in itself is an unenviable achievement) or engaging dialogue. It simply bumbles along from one badly-drawn shootout to the next. From an historical point of view, the story is accurate. However, making history interesting depends greatly on an author’s storytelling skill – a good writer can make even the most boring subject engaging. A major failing of this work is that it’s very much a history of the 1916 Rising as a military event; we begin on Easter Sunday and end with the execution of the Rising’s leaders. 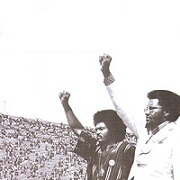 It lacks historical context – what are the motivations of those involved? What is the historical, social and economic background? How did such an “unlikely band of freedom fighters”, as Hunt calls them, get to this point? What did they realistically hope to achieve? Instead, we are presented only with the deconextualised brave rebel leaders and volunteers of bourgeois republican myth, who fight and die for “dear old Ireland”. The dialogue rarely raises itself above the level of a 1980s British war comic, indeed if the British were German they would be screaming “Achtung! Achtung!” and “Gott in Himmel!” However, the main failing of this work is that it is just not engaging – perhaps because it just flits from firefight to firefight, one doesn’t build a relationship with the rebels. I think the author recognises this, and bookends the main story with Plunkett’s death-bed marriage in a failed attempt to give it some human context – but given how little we see of Plunkett in the story it feels crowbarred in. It is not impossible to weave an ‘ensemble piece’ in graphic format, but perhaps this would have fared better had it focused only one or two of the leaders or volunteers and showed us the Rising from their unique perspectives. 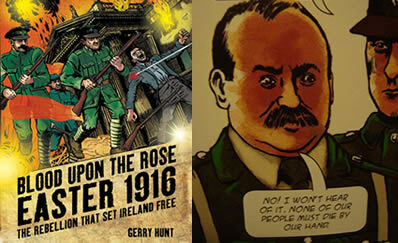 Undoubtedly there is a gripping comic to be written about the Irish Revolution. This, alas, is not it.